Somehow, my father re-emerged. What it meant to me was that each Sunday I would either board a tram or walk to his new apartment and have lunch there. My mother had tried to get him to contribute to my support, but he wasn’t interested. On the other hand, each Sunday, after lunch, he would give me an allowance of twenty francs and send me on my way. Although not enough to help my mother with my support, twenty francs was a huge sum for me, enough money for three movies and a few francs left for candy emergencies the rest of the week. Movies had come to Brussels! There were several new movie palaces with names such as the Churchill, the Roosevelt or the De Gaulle, that showed the “latest” films, usually in English with French subtitles, that had been made during the war and were now getting to us. There were also one or two smaller, more dilapidated movie houses that specialized in “oldies”, shaky, grainy films about those daring aces in their biplanes during World War I, and there were the neighborhood theaters which might show either American or French films of uncertain vintage. None of them showed double bills. It was an idea which had simply not crossed the ocean, and so each Sunday I betook myself to three different movie theaters. It never occurred to me that these were on a schedule or that you had to watch them from the beginning. I just got to them whenever I felt like it, paid my five francs, and sat in the back somewhere. I watched the movies from wherever they were in the story, transfixed, try to figure out the plot or what had happened previously, what I had missed, and when they ended, stayed for the beginning of the next show to confirm what I had guessed or missed about the plots. I became remarkably good at it, or the plots were remarkably predictable, but nevertheless, it was all wonderful! I loved the movies, although I generally left them with a considerable headache. My friend Harry Jacobowitz (his mother had survived and can be seen in three of the photographs in the early part of this blog) went to England one year, and returned with tales of cowboy movies ruled over by Roy Rodgers (the King of the Cowboys!) , Gene Autry (the Singing Cowboy! ), Hopalong Cassidy, Lash LaRue, and other stalwarts of the “silver screen”. Soon I had found their films in Brussels, and Harry had been right; they really were great! 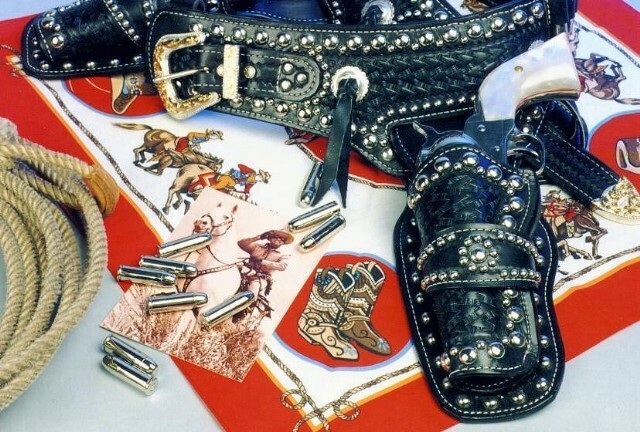 It wasn’t long before I also wanted to be a cowboy, and to be a cowboy meant you needed a horse, a gun and a fancy holster. I knew that I couldn’t get a horse or a gun, but getting a fancy holster, that was a possibility! All it involved was making one myself. So, one day, I went home, rooted around my mother’s closet, found her best leather pocket book, cut it apart, drew the shape of a holster on its remains and discovered that I had nothing with which to stitch my new holster together. All I had created was another mess, this time out of leather, and when my mother came home and saw what I had done to her favorite pocketbook. . . It wasn’t always easy being my mother. What it was supposed to look like. . . I knew that you had the right stuff in you. You should have moved to Colorado and tried your luck working on a ranch for a summer.